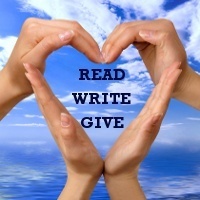 Earlier this year I began a column on the blog called ‘Read, Write, Give,’ interviewing bloggers to find out more about them and their favorite charities. I have said many times that I believe book bloggers to be the fairy godparents of the indie community, and have long looked for ways to ‘give back.’ This was just a small way, and while I initially set it up to run for six months with a giveaway tie-in, I hoped it would become a more permanent fixture on the blog. Next week, the giveaway ends, but I am thrilled to say that I have loved every interview, and fully intend for the column to continue. Thank you so much to all the bloggers who have agreed to be interviewed so far! Your generosity of time and spirit has raised $650 for charities across the world. Next week is Celebrating Bloggers (10-13 September) and it really is all about celebrating the amazing work of the book-blogging community. I’m inviting bloggers to write about why they blog/review and what it means to them, and authors to blog about how bloggers have supported them and helped to get their work seen. It’s not too late to sign up! For bloggers there will be a $100 Amazon gift card awarded for a randomly chosen post. There’s also a ‘share it on’ giveaway, where you could win a $50 Amazon gift card for yourself, plus $50 for your favorite charity just by spreading the word. I’m so excited about next week and reading all the posts. I’ll be sharing some snippets here every day, plus posting a video interview on Wednesday 12th about my own fantastic experience with bloggers!